Martin Findell is a Research Associate at the University of Leicester. He is particularly interested in the problems of understanding the relationship between spelling and sound change in the early Germanic languages, and in the uses and abuses of runes in the twentieth and twenty-first centuries. 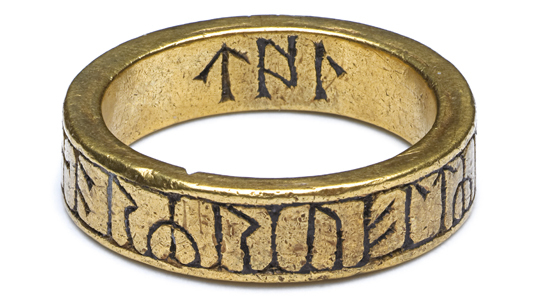 In this blog Martin discusses some of the runic writing on display in Vikings: life and legend. Call it perversity, but in my own research I’ve always had a taste for the unfashionable and the unglamorous areas of runic writing. I get more excited about a name scratched onto the back of a brooch than about a large and richly decorated runestone; and as a historical linguist, I take more pleasure in trying to work out problems of the relationship between spelling, speech and the changing structure of language than in broader questions of cultural history and society. Of course the two are interdependent, and while I concern myself with the troublesome nuts-and-bolts details of language, language is an aspect of culture and must be studied alongside other aspects of culture. Even the briefest and most unattractive inscription is an instance of language use by real people who belonged to a community in which the act of writing had some purpose. Rather than regale you with tales of unstressed vowels, I thought it would be more interesting to share my interest in some of the texts we find written in runes, and what they might tell us about the people who produced them. One of the most impressive objects in the Vikings exhibition (if somewhat overshadowed by the great Roskilde ship) is a replica of the Jelling stone. The original is at the large royal complex at Jelling in southern Denmark, and was commissioned by Harald Bluetooth to honour his parents and boast of his own achievements. The inscription says “King Harald ordered this monument made in memory of Gorm his father and Þorvi his mother; that Harald who won for himself all of Denmark and Norway, and who made the Danes Christian” (translation based on that in the Samnordisk rundatabas). The memorial text is formulaic, and similar to inscriptions found all over Viking-Age Scandinavia (with a particular concentration in the Uppland region of Sweden, where several thousand have been found). The stone is probably best seen as a political statement, particularly when it comes to Harald’s display of his Christian credentials; lest the viewer be left in any doubt, one face of the stone is carved with an image of the Crucifixion. The Jelling stone is an inscription made for a king, but not by him. The people who did the actual work – and importantly for linguists, these were probably also the people who made decisions about things like spelling – were craftsmen, possibly attached to Harald’s court, who remain silent in the historical record. One of my favourite inscriptions lies at the other end of the scale: a short, personal message, informally scratched on the back of a brooch found in a sixth-century woman’s grave at Bad Krozingen in Baden-Württemberg, Germany. The inscription reads boba:leub agirike, “Bōba, dear to Agirik”. Bōba is the name of a woman, perhaps that of the woman buried with the brooch (although not necessarily – valuable pieces of jewellery like this could be passed on as heirlooms, or looted and given to someone other than the original owner), and Agirik is a man. It is likely that he wrote the inscription himself – it is not a work of professional craftsmanship (which the brooch certainly is), and the fact that the message is on the back of the brooch means that it would not have been visible when worn. We have no way of knowing what the relationship between these two people was. They might have been husband and wife, father and daughter, brother and sister, or related in some other way; but this slender piece of evidence helps to remind us that these were real people, people who knew and cared for one another. It might not tell us much about the large-scale political and religious trends of the society in which they lived, but it brings both the words and objects of the past to life as something familiar, human and all too short-lived. British Museum Press and can be found on our online shop.